Yesterday I flew into Laguardia Airport (LGA) in New York City and was spending the night at our crew hotel right by the airport. We don’t have too many flights into LGA so I don’t get to stay there very often and most of the time when I do stay there we get in pretty late. However, yesterday we were scheduled to get in at 1pm. Being in NYC that early in the day I knew I had to do something with my day. I immediately thought of paying a visit to the Tools For Working Wood showroom. Joel has mentioned on his blog several times about being located in a warehouse and after doing a little map study on Google Maps I knew it was a pretty industrial neighborhood. This is a picture of the building at the street address. Not much to see here to indicate that you’re in the right place, but I went inside hoping to find a sign. No sign. I had written down the street address and had a print-out of the Google Maps directions, but I knew I was missing a key piece of information. I pulled up the TFWW site on my phone and found that key piece of information – 5th Floor! Up the stairs I went. There are apparently a couple of huge freight elevators I could have used, but I knew the stairs would work. On the 5th floor I finally found a sign. 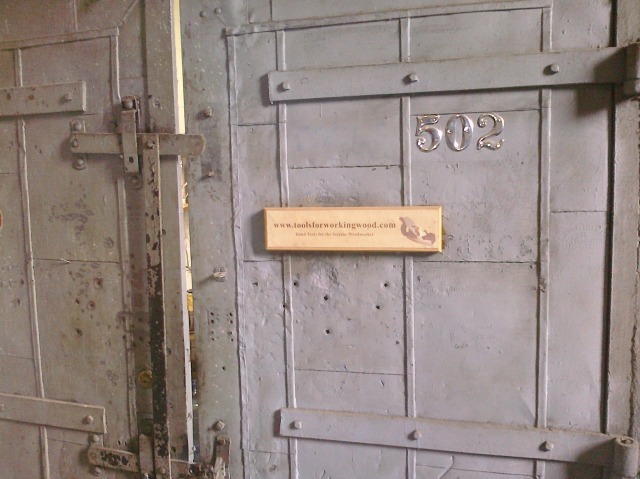 Not a big sign by any means, but a sign none the less (are those bullet holes in the door?). The “store” is really just a corner of the warehouse space that has some displays set up. Not spiffy at all, but very functional. They have two benches set up, one of which I recognized immediately as the location where a lot of the photos for the website are taken – there’s great natural light next to a huge wall of windows. 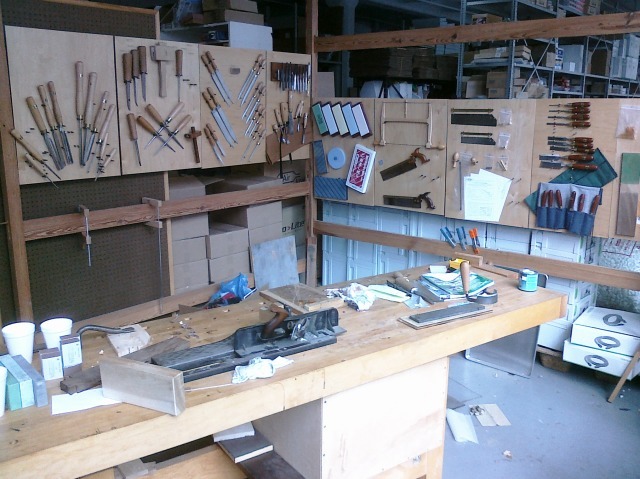 As you can see the hand tools are all on display and customers are free to try out as many as you see fit. I was particularly interested in seeing the difference between the Ashley Isles Mark 2bench chisels and the Round Back chisels. I cut two dovetails with the Gramercy dovetail saw and proceeded to chop out the waste using one 3/8″ chisel for each. The Mark 2 chisel felt nice and pretty balanced, very similar to the cheap Czechoslovakian bench chisels I have now – which “feel” fine to use but don’t hold an edge as long as I would like and have too much of a flat grind on the side of the blades. The Round Back chisel felt very nice to hold by the blade (which is how I hold a chisel when chopping the waste between tails). There was definitely more “feedback” (bending/give) in the Round Back blade than with the Mark 2’s when I tried to take a heavy chop – heavier than I would normally execute, but I was testing them. Having said that, I didn’t find the “feedback” to be a negative thing – I kind of liked it. I think it would definitely let you know when you need a quick honing of when to re-attack the work. The Mark 2’s are marketed as bench chisels and the Round Backs are Dovetailing chisels. As for the flat grind on the side of the blades, the Mark 2 chisel had a very small flat area – probably only 1/32-3/64’s. The flat on the Round Back was even slightly smaller still. I wasn’t completely convinced one way or another. But I’m leaning towards the Round Backs. We’ll see. I think these chisels are a good value for the price. I would probably order the 1/8″-1″ set of six for $166, but they are out of stock right now. One additional thing that really like about the Round Backs is that they do not get taller (profile view) as you get closed to the handle like bench chisels do. That means that if you need to pare between two tails and you can fit the chisel though the gap, it will go all the way to the bottom of the tail. I also means that they won’t get taller with higher sides as you sharpen them – which is nice. I also spent a bit of time with Joel Moskowitz chatting about tools, woodworking and life in general. It was a nice visit. 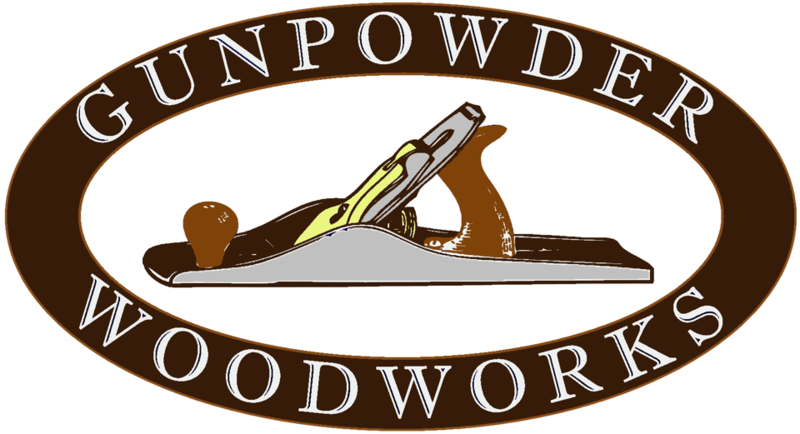 If you are into woodworking(and you probably are if you’re still reading this) then I would recommend you stop by to try out the tools if you’re in the vicinity. Just be prepared for a little bit of a treasure hunt to find the place. Previous Post Handplane or Sand before finishing? Next Post It’s a Chicken Coop!